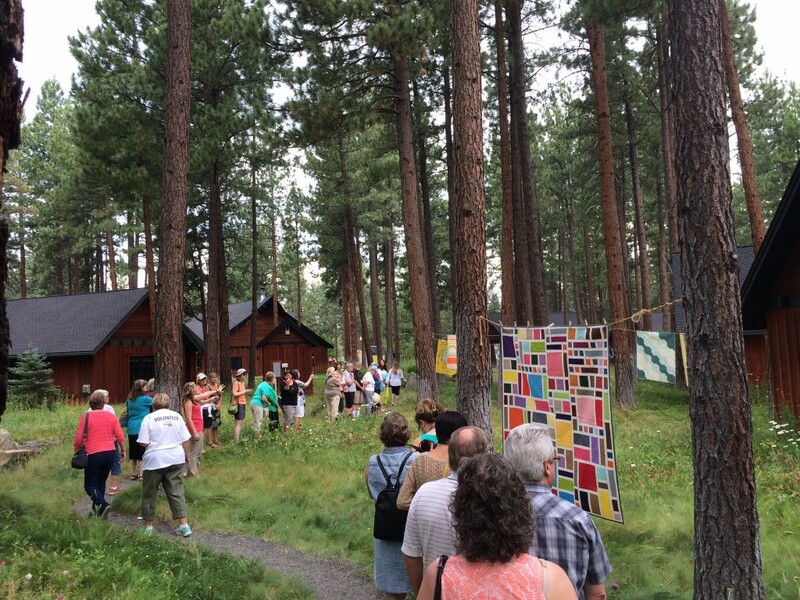 Last week, I had the amazing pleasure to teach at The Quilter’s Affair and attend the Sisters Outdoor Quilt Show (hosted by Jean and Valori Wells). 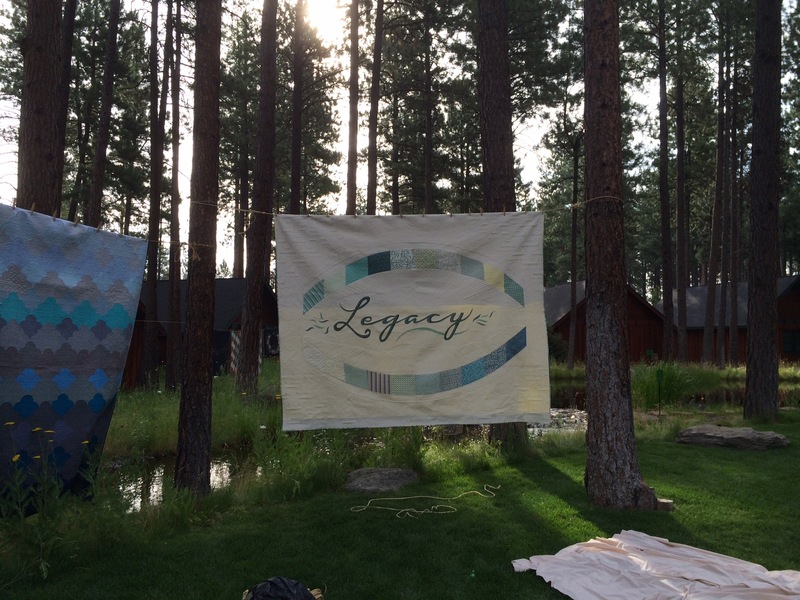 As if that wasn’t honor enough, they asked me to be the featured quilter for Save It For Sunday. 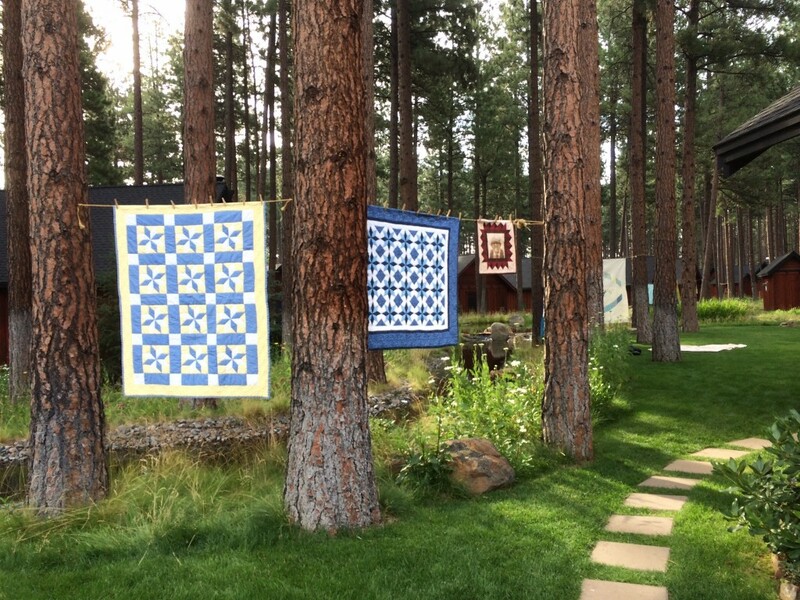 The day after the show, they hung several of my quilts among the trees at a gorgeous resort. 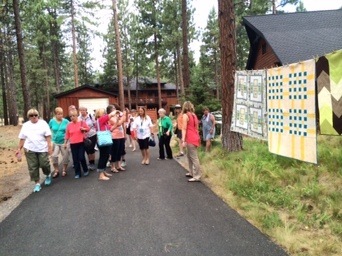 As a part of the exhibit, I gave walking tours and discussed the quilts and my journey as a quilter. Even Valori Wells helped hang the quilts. The experience was one that I will never forget as long as I live. It was more emotional than I had thought it would be. 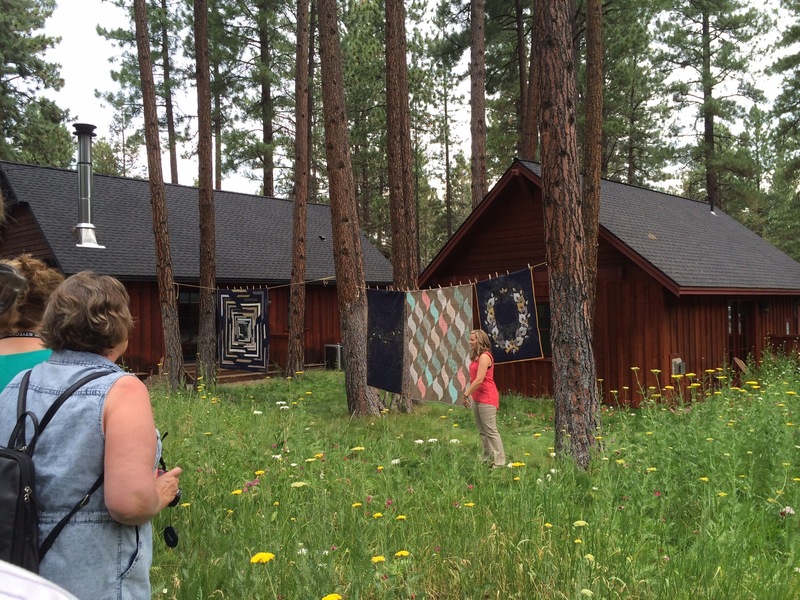 Seeing my quilts hung in such a beautiful setting and getting to share the story about Grandpa was such a visual reminder of the huge role he played in my life. I will always miss Grandpa, that’s a given, but that day, I missed him more than ever. If he would have been there, he would have been riding around in his electric scooter and flirting with all the ladies. I would have probably have had to mock-scold him at least twice for distracting people. The stories that my family tells about Grandpa is his legacy. He left more than just the love of quilting, he left a legacy of putting family first and being the best Grandpa I have ever known. Now, I would love to “walk” you through the exhibit. The best thing? You don’t even have to leave your room…. 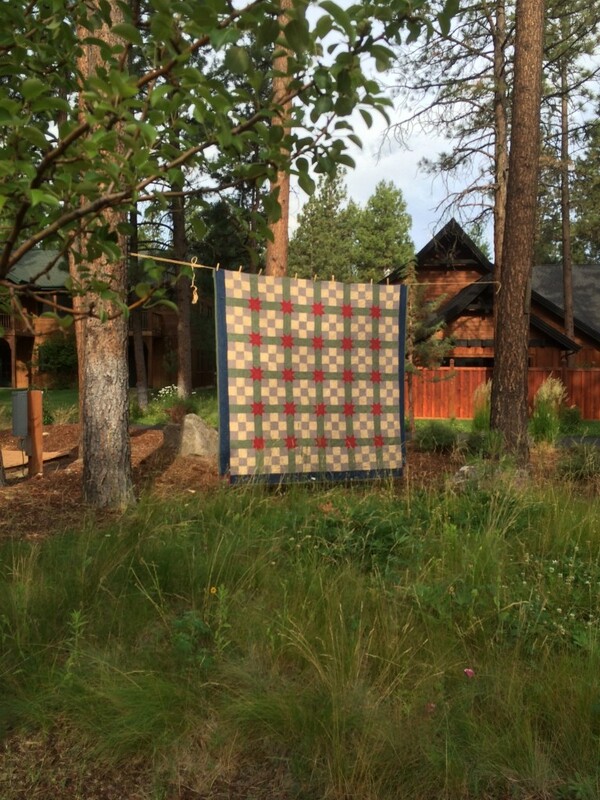 First up, the quilt that started it all. This is the quilt that Grandpa helped me make over 12 years ago. We still use it every night on our bed! The first quilt that Grandpa helped me make. I didn’t put all the quilts in chronological order, the following quilt was finished several years after I started quilting. Before Grandpa passed away, he pieced this quilt top for my daughter, Cloe, and asked me to quilt it. Years after he passed away, it was finally finished and used in a book. It’s our only published collaboration and is a great example of his love of Amish quilts and my love of quilting things to death. The next few quilts in the exhibit included my second and third quilt, both of which were hand quilted. Why I went from a 9-patch to a LeMoyne star block with Y seams, I will never know! The last quilt on the right is a portrait quilt I made of Grandpa after he passed away. It hangs in my studio and reminds me of him daily. (from left) Falling in love modern quilting, publishing my first book, my first fabric line, and my first booth at Quilt market. Emily Cier’s quilt, Cumulus, and my Legacy quilt, highlighting my second fabric collection. More quilts showing my love of quilting things to death. Quilting for customers is one of my favorite things to do! 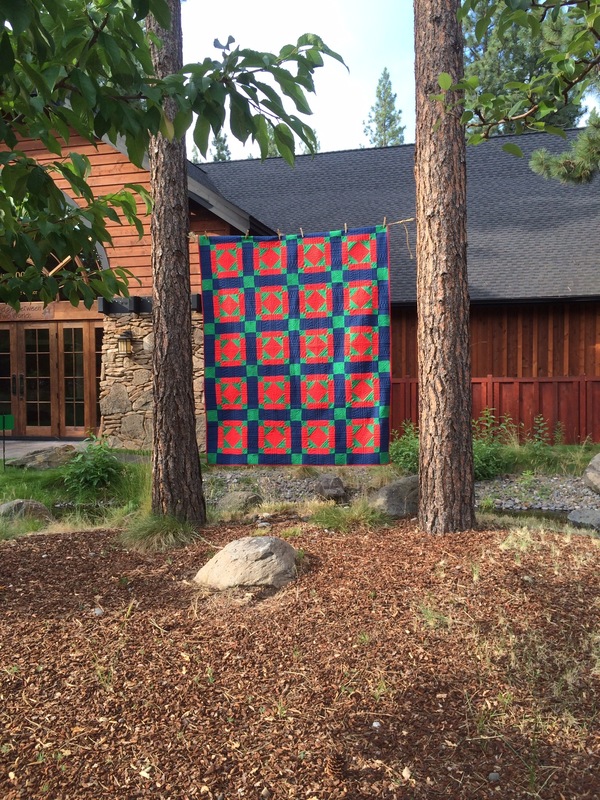 Here I show some of the quilts that I have quilted for Julie Herman. 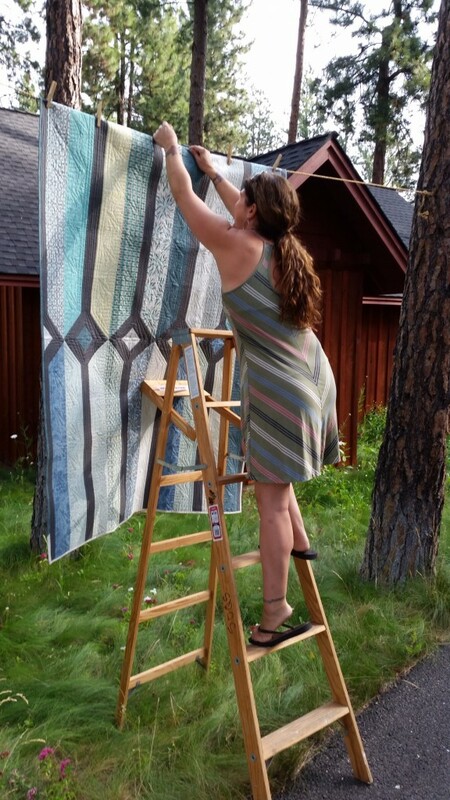 I love showing how the quilting can really change the look of the quilt. I also pointed out a mistake on one of the quilts (good thing you can’t see it on the photo!!) and talked about how some mistakes are ok to leave on the quilt. Not sure why I was making this face…. Emily Cier also let me borrow some of her quilts for the exhibit. The problem with quilting for customers is that you need to send them back! I discussed quilting on solids and using the inspiration of the pattern to help pick designs. 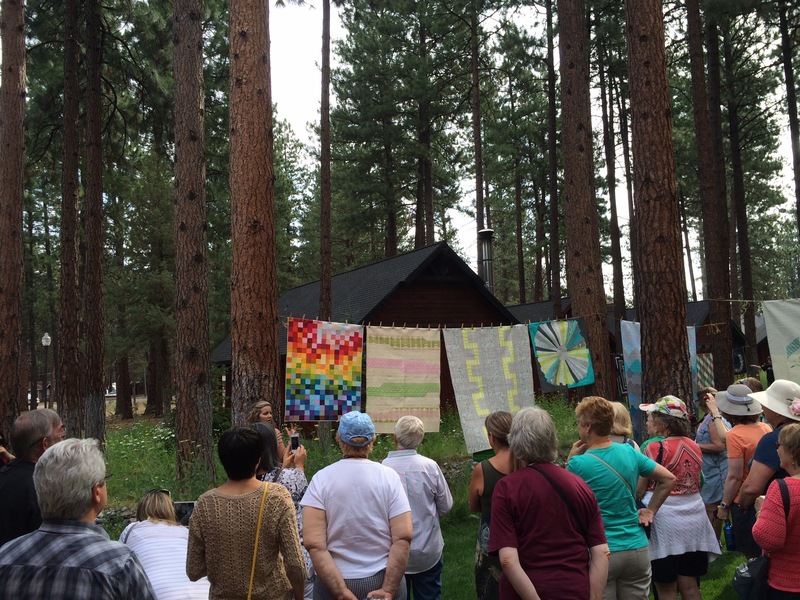 More quilts, more stories…..in the interest of your time, I’ll skip over some of it…..
At the end of the tour, I showed my most recent quilts. (Fractured Squares, Dressy Wholecloth, Coral and Laurel, three of which feature my newest fabric collection, Athena). Even though they were the last quilts of the exhibit, I told the group that I hoped that one day I would look back and these quilts would represent the middle part of my quilting career. Hopefully, I have many more years ahead…. From start to finish, it was a magical day and I can’t thank Jean and Valori enough for selecting me. The whole day was a little funny, a little sad and hopefully a little encouraging to those that walked along with me. I hope that one day the stories that people tell about me will make Grandpa proud. Thank you for reading this and walking along with me on this amazing, crazy quilting journey. I know I am way late in reading this post...my daughter got married August 1 and I was quilting her wedding quilt (with your books nearby for handy reference!). That said, if I had known you were going to be at the Sisters Quilt Show, I would have driven down just for that!!! Thank you for having a mini show here!!! dear angela, we almost share the same last name, but I don't have an S at the end. I love your grandpa's sayings, could you make a list of his sayings and post it on the side of your blog. I have a longarm and hope to use it more, you are an inspiration. 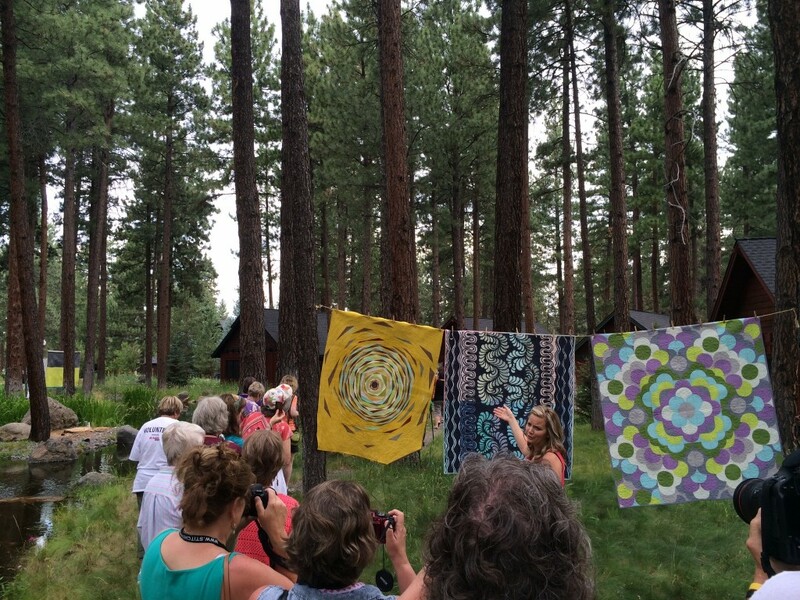 Angela these quilts and your story are beautiful. You were so blessed to have such a Grandps in your life. 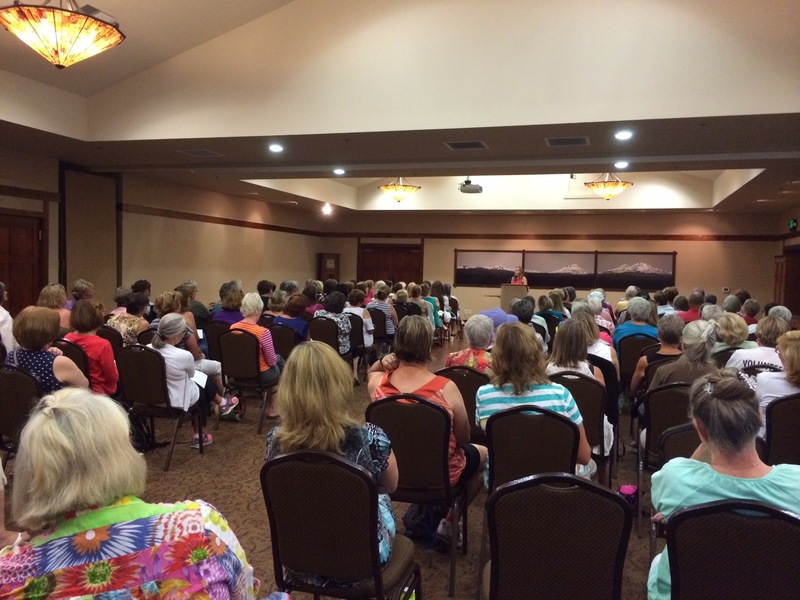 I was at Sisters this year but had to leave early, and was not able to attend this event. I was lucky enough to be in Julie's Fri class so got the bonus of your brief lecture. Thanks for sharing. I hope to eventually be able to get into one of your classes. Your work is inspiring! Thanks so much!! You are way too sweet!